As an adoptive parent I’m always keeping an eye out for children’s books that are out there which resonate with our own son’s adoption story. Because adoption stories can vary from each other tremendously there aren’t a lot out there that resonate with each family’s story. Until the other day I had only one children’s book on adoption on my bookshelf, which is a decent one, but again, because it gets specific in the details in the story of what happened on the night of that one particular adopted child’s birth, it doesn’t capture our story the way I would like. Keep in mind also that the type of adoption that took place (example: international vs. domestic vs. foster care) vary tremendously from each other. So finding a good children’s book for an adopted child is really no easy task. 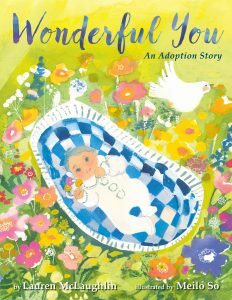 With that said I’d like to give a shout out to a new children’s book sent to me by Blue Slip Media (to be released on April 25) called Wonderful You by Lauren McLaughlin. This story resonated with me because the focus of the book centers around the concept of an open adoption where a birthmother searches for and selects the parents for her unborn child. The moment I opened up the cover of the book I was intrigued by the bright and vibrant colors. As an artist I appreciate good artwork and the illustrations by Meilo So are truly beautifully done. Each page is its own masterpiece. 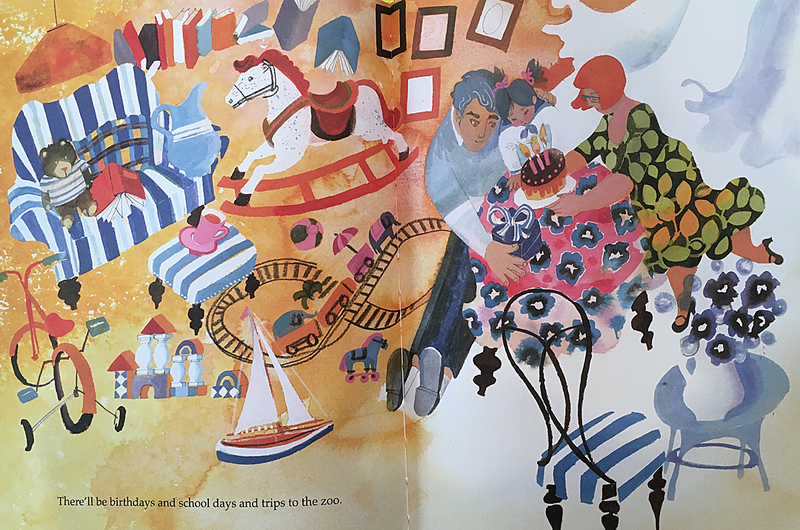 The story goes on for several pages with the girl growing into a toddler then a young child and the adoptive family is shown having lots of fun together doing various activities and living life together as a true family. 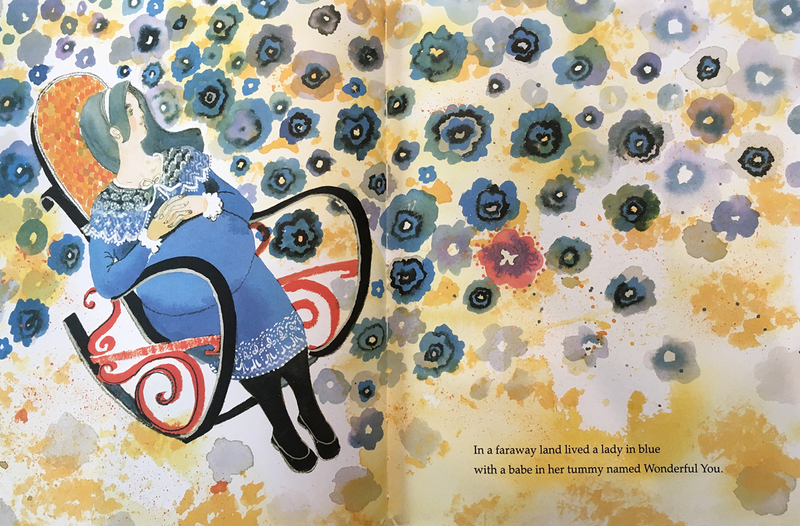 Near the back of the book ‘a woman in blue’ shows up again on a faraway perch up in the sky watching over her child and her parents as they get ready for bed. The book ends with the adoptive family of three playing lovingly together. I have read this book a half a dozen times now and I love it despite the fact that I can’t seem to get through it without shedding at least one tear. I’ve shared it just once so far with my son who seemed to enjoy it. His only comment throughout the book said in his sweet little voice was, “Don’t cry Mommy,” which he is used to saying whenever I tell him about the days surrounding his birth. If your family was formed through an open adoption or if you are thinking of giving a gift to another adoptive family who went through an open adoption this book really is an absolute must. It may even be appropriate for families of international adoptions as well although birthmothers would likely be more mystical characters to the children vs. reality since the process is done so differently. Either way, this book is a nice addition for both children and adults in the adoption community. Note: Although Blue Slip Media contacted me to consider reviewing this new book for them it was not at all an obligation and reviewing the book was purely voluntary on my part with no money exchanged. I am happy passing along adoption resources that help other adoptive families or bring them joy.